Today I am on like.. day 17 of working on a sculpture of the lead singer for a metal band. It’s getting so detailed and complex I’m beginning to worry about my computer handling it.. I thought up a new strategy for working on miniatures I want to try on my next project. it’s more of a divide and conquer strategy than an overall build up like most Zbrush sculptures do. Then once an area is finished I can be done with it, put it away and work on a clean slate on another. I think it’ll work great.. Getting some good freelance gigs and in about 3 weeks I start work on my demo reel and resume and I’m really stoked to see how it all goes! Time for a drink, it’s been a long 17 days working on this piece. Module 12 has come and gone. I got great freelance news today, a current project is coming along! (although it’s getting overwhelming, yet rewarding?) Here’s my updated axe weapon, and ammo box I’m making for school. Tweaking, tweaking, and some more tweaking has been done! ETA to creating my new demo reel/portfolio is about 4 weeks!!! Here’s homework I had to do today, about 6 hours worth. I made the fabric texture as an exercise. 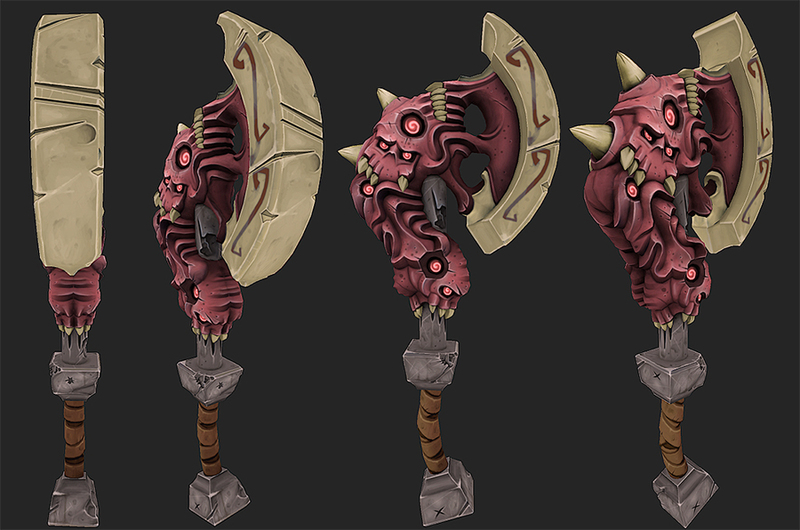 sculpted, painting, and set it up in maya. The ammo box below took about 5 hours. I made the low poly this morning, UV’d it. 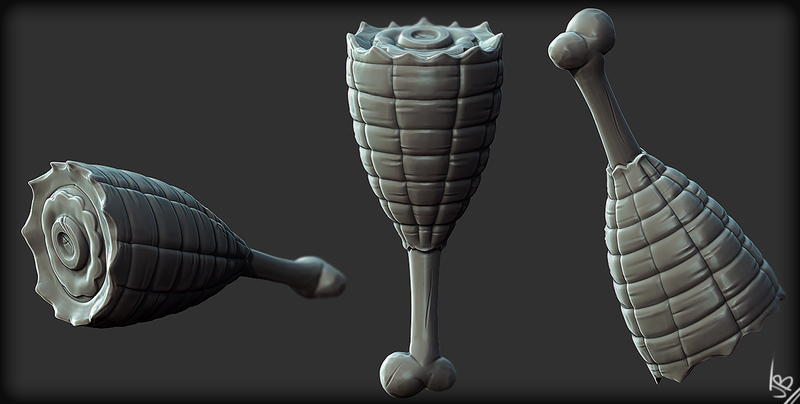 Set it up for Zbrush and sculpted all the detail. Still need to clean the sculpt but now I need to go work on freelance work! Cheers. 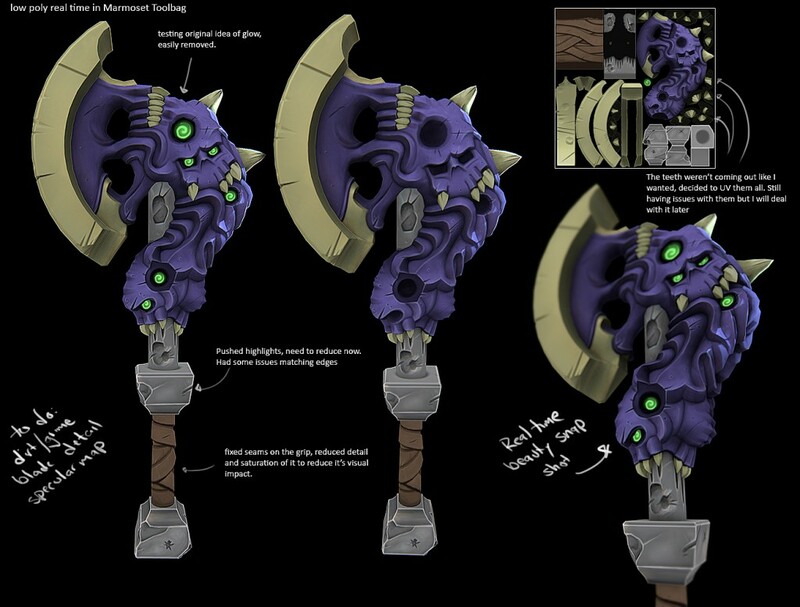 Making an extra prop and then some textures for my portfolio during this semester for some extra credit. Here’s a sculpt of my first one that I need to retopo. I was accused of not having enough meat on my weapon for school by a friend? haha. Here’s a meat haunch work in progress. Well… midterms have passed, my brother’s wedding is over and it’s time for me to kick work into over drive. As many jobs and projects as I possibly can over the next 2 months before I start building my new demo reel and portfolio. Lets get to it!! Fight Night Fight Night Fight Night! The long awaited rematch of Anderson Silva and Chael Sonnen is happening tonight finally! Midterms are almost done for summer semester (just have to have my girlfriend edit a paper because I don’t trust my writing skills) and then I’m almost done! Going by quick and I hope to keep my grades at A’s the whole summer! Freelance is picking up a bit more, creating my first fully articulated figure soon, really concert/excited concited is the word I’ll make for that emotion. Time to get to it!! Hard at work on this school project still… Lots and lots to do! here’s an update and some working notes for myself/professor. Time to do test some software for a client!